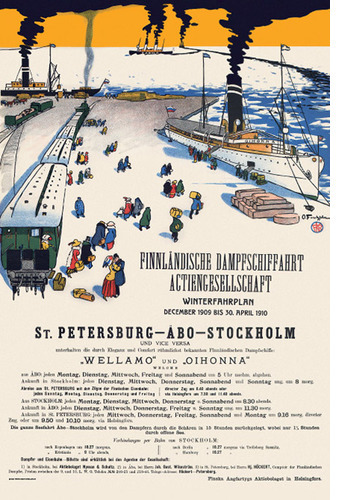 In the past, the natural northern sea route went between the cities Stockholm-Turku (Åbo)-St Petersburg. The Finland Steamship Company (FÅA) held a frontline position. In the poster the pride and joys of the steamers Oihonna and Tarmo can be seen. The poster is unique because it offers small, sweet caricatures that follow the European model. 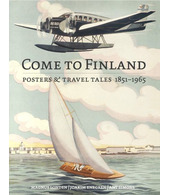 Poster art in Finland was still in its infancy, and injecting some humour was a daring move by the artist Oscar Furuhjelm. Also note the terribly black smoke rising towards the sky. This sort of thing is not considered acceptable today! However, at that time machines represented power and a modern way of life, and very dirty smoke was simply a good thing. 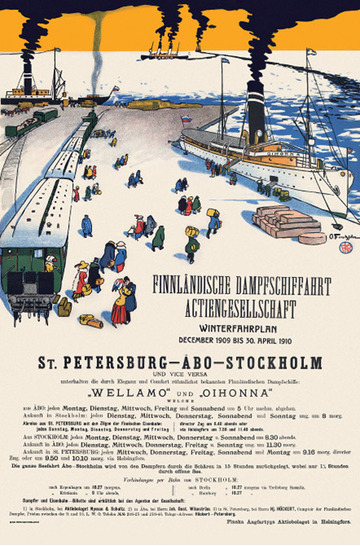 Furuhjelm’s works were most likely used for different advertising purposes by the Finland Steamship Company. One simply glued on a relevant time table at the bottom – and then the ad campaign was done. The picture depicts the harbour of Hanko. The city of Hanko was founded in 1874 because Finland needed a winter harbour. Not quite 20 years later Finland Steamship Company launched regular passenger traffic from and to Copenhagen and onward to Hull in England.